Teahupo’o, Tahiti – (July 23, 2015) -- It’s easy to see how Jamie O’Brien became known as one of surfing’s most entertaining figures. He's a barrel-riding master, movie producer, prankster and all-around game changer. Not to mention the star of a successful web series now in it’s fourth season, Who Is JOB 5.0. Determined to make the latest installment of the original series his wildest one yet, JOB turns up the heat - literally - by surfing on fire at one of the most dangerous waves in the world. To check out the video and read the full story click here, and tune-in to Red Bull TV on August 7th to catch the complete behind-the-scenes episode. The idea of surfing on fire began over a year ago when JOB reached out to his fans asking them for ideas of what he should do next, when he received a direct message on Instagram. “They said ‘it would be cool if you lit yourself on fire’ and I thought, might as well. So I went into Red Bull and I said hey, I want to light myself on fire and go into a barrel at Teahupo’o, and they looked at me like are you for real?” O’Brien recalled. Over the course of 12 months, Riley, O’Brien and team performed two fire safety tests in California and one additional test in Hawaii to assess the feasibility of the idea and to get Jamie comfortable with being set on fire. They spent months testing various combinations of fire protective layers and even had Body Glove make a custom wetsuit for JOB, moving all the life-saving flotation devices to the front of the wetsuit and away from the fire. “They were telling me how some people panic and react differently around the fire, they think they’ll be fine and they get lit on fire and they just panic. So I was like god I hope I don’t panic,” says O’Brien. On the morning of July 22, after a year of preparation and waiting for the perfect swell conditions, O’Brien was finally ready. It took a team of nearly 25 people including members of fire safety, water safety, production crew and photographers who all came together to make Jamie’s dream of surfing on fire a reality, and the result was indescribable. 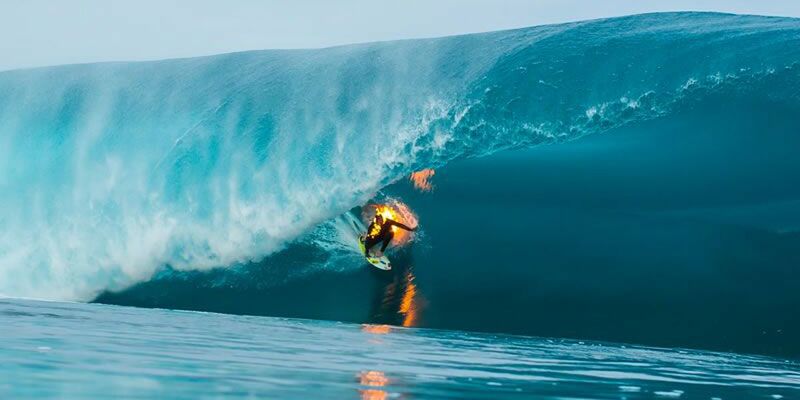 “When you’re on fire in the barrel, the whole wave lights up fluorescent orange. It’s a really crazy feeling that you can’t even explain. I’ve been surfing big waves my entire life but this time I had this flame just wrapping around my head, which was pretty insane! Something totally different than anything I’ve ever done before,” O’Brien shared after he completed the feat. It’s not an easy process, even for a team of professional stunt coordinators, safety personnel and surfers, but when each step is performed correctly, the final product is a brilliantly illuminated surfer in the middle of the dark ocean. In short, don’t try this at home. To watch previous episodes of Who Is JOB 5.0, go to redbull.tv/whoisjob5, and tune-in August 7th for the full story.